Mike Maloney from goldsilver.com has a new website, click here. Although I haven’t read everything, it seems more focused on educating about wealth cycles, especially the one we are in (i.e. precious metals). Check it out, if you like. We have all heard the rumors that the nations of the UN (and those not in the UN) would like to abandon the USDollar as the world’s reserve currency. Click here. We have now moved to a formal report from the UN. Gold still holding onto the teacup-handle formation. Click here. The S&P500 barely held 1040 yesterday. They goosed it the last 20 minutes to 1041. Closing below 1040 confirms this downward trend for stocks. In groovygirl’s mind, yesterday’s manipulation means it is just a matter of time before we resume the downward trend in stocks. We have been going down/sideways since Martin Armstrong’s date in mid April of this year. Jim Sinclair comments on yesterday’s market moves. Click here. Update: S&P500 closed below 1040 today at 1030. Click here for the latest Thunder Road Report (35 pages). Excellent report. Nice references to Martin Armstrong and his current writings and communications. Loved the retort to the FT comment that gold doesn’t make investors any money. So you own an asset, it’s price goes up…let’s say from US$250/oz to US$1,200/oz in gold’s case, or from anywhere in between, and you don’t make any money? That’s a new one – it seems like the FT has some kind of reverse accounting system. Groovygirl read that FT post and thought the same thing. What? Huh? I didn’t make any money the last 5 years. Oops, I must not know how to read my own balance sheet. Side musing: all groovygirl has to say about the Bilderberg Group is….they have no Asians or Indians on their “list”. If they do not expand their club quickly, they will lose their influence. In light of that, I wonder if the pursuit for one-world government falls short and fractures into nation-states (in the long-term). Hard to talk up one world government when the global reserve currency, the USDollar, and the back-up, the Euro, are failing miserably. Update on the gold movement yesterday. Click here for Jim Sinclair’s comments. Do not be fooled into selling your positions. Nobody wants to buy or sell, only manipulate price, when they bid ten times what the offering is or offers ten times what the bid is in an open outcry market. Click here for an article by Jim Willie about possible solutions to this currency crisis. The G-20 was just a confirmation in groovygirl’s eyes that nations are going in different directions. There is no united front to solve this global currency crisis. As a result, I think we will see a prolonged, drawn-out currency crisis and that will result in a hyperinflationary depression for the US at the very least. I think we will see several currency “solutions”, their failure, and then other “solutions”. This path will play havoc on international trade. It will bid up natural resources. It will cause the world to buy up gold and silver. Do not look for stability to return and business as usual to return in the US for years. I am beginning to think that 2015 will be the first big crisis of many crisis points on this currency merry-go-round, perhaps the big global disillusionment peak for the dollar, a sovereign debt default. But no real solution, just currency chaos. At some point the destruction of global economies will be so great, that they will be forced to work together for a solution. We are far from that place and I do not see that changing 180 degrees in five years. Be prepared for a long currency crisis or a series of currency breakdowns. Gold and silver will continue to be the preferred currency of choice for the world. Silver has been trying to breakout past the $19-$20 point for a long time. Groovygirl had kind of given up on silver, thinking it could be years before this market reflected reality. But, it seems to be getting closer. No exact date, just closer. Silver has a very small trading market and is easily manipulated by the Big Boys. But as always, the market will correct to reality to some point in this bull market. Click here for Jesse’s chart and explanation. You will have to scroll down a bit to get to the silver discussion. The silver formation is so big and so powerful looking that the breakout, when it eventually comes, might well look like a shaped charge sending out a jet of hot plasma vaporizing a hole through stop losses and short positions. Side musing: Hey, Gold, nice tea cup. Click here. A little philosophy mixed in…. If you have time for a long, thought-provoking essay, check out the page to the right “Welcome to the Insane Asylum” by cognitive dissonance first presented as a 5-part essay on the zerohedge.com website. Side musing: The long-awaited Financial Reform bill has been produced by the House and Senate committees. NOTHING is fixed. Buy gold and silver. The longer they refuse to deal with the systemic problems, the worse it will end. Click here. Side-side musing: only 3 banks closed yesterday. Groovygirl thinks something is not right. The FDIC has over 750 banks on their watch list and they should have at least 1500. So, why are they closing so few banks? It is not like these watched banks all of a sudden became solvent because the economy is growing. Groovygirl thinks either FDIC is broke, waiting for more money from the government; gov is stalling and waiting to see if the economy does come back and solves some of the banks’ problems; there is some measure in the financial bill that will change the situation; or they are stalling and planning another course of action (like a mass closing at the next financial crisis, buying up bad banks at next crisis, selling the bad assets they have on their books right now to get more funds). This banking crisis is NOT fixed, do not let the low number of closed banks fool you. Rosenberg has a great post out. Click here. This is the information contained in the chart; do what you like with it. Assuming inflation averages 2% annually and that 2016 marks the end of this secular bear episode (seeing as it began in 2000) then the historical pattern would suggest a test of 5,000 on the Dow as the ultimate trough (at that point, gold will likely be 5,000 too). This does not preclude cyclical rallies along the way, but these will be “bear market rallies” such as we saw from March 2009 to April 2010 and investors should not be tempted into any other strategy than to rent these rallies and not own them. Groovygirl has a few comments on Rosenberg’s thoughts. First he is speaking of the Gold/Dow ratio that groovygirl (and others) have been talking about. This is the calculation that groovygirl will use to start thinking about selling gold and buying another investment. It is groovygirl’s opinion that $5000 is too low a price for a 1:1 ratio event for the Gold/Dow ratio. I think something closer to $10,000 and $10,000 because of inflation-hyperinflationary pressures. I also think 1:1 ratio is too high. Mike with goldandsilver.com thinks that it will over shoot in a currency crisis such as we are facing. Groovygirl agrees and thinks that it will be closer to 1 to .5. We are currently around 7. Seven pieces of gold for 1 piece of the dow. I think it will be a low of one-half an ounce of gold for 1 piece of the dow. The lower this ratio the better investment gold is over stocks. Taking a look at Rosenberg’s chart, it is clear to see the seasonal patterns of the K-wave long cycle. 1980-2000 was the fall season, before that the summer, before that the spring, and the Great Depression was the last winter cycle. The Long Wave Group has slightly different dates, but it is close enough on such a long timeline. Groovygirl likes his 2016 date. There are several waves (6 of them)cycling down at the same time in the 2014-2016 time period. That doesn’t necessarily mean sell gold in 2016. It means look at what is going on at that time. It is very possible that we have a currency crisis in 2015 forcing the revalue of the USDollar, but gold continues to go up for another few years. The world will not feel confident about any new reserve currency right away, even if there is some gold in the mix. If the US/Europe still controls that reserve currency and China is left out in the cold, they will take their ball and go back to Asia, leaving half the globe uninvested in the new currency. Lots of possibilities. When Martin Armstrong talked about gold last fall, he called for $5000 gold by 2015. The take-away: here is another confirmation that 2015 is a key date and gold is going much higher from here and gold is still better than stocks. Based on economic history and the current trends, groovygirl is presenting some possibilities about how this currency crisis and sovereign debt crisis might play out. The more information you have, the better you can protect your investments from different scenarios. No one can predict the future, we can only make educated guesses here. 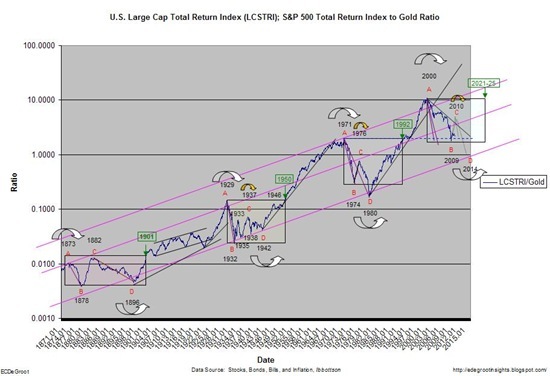 Side musing: here is a chart from Jim Sinclair’s site illustrating the same trend, but from the viewpoint of the S&P500 vs. gold making a low in 2014. Please note that in the last winter cycle (The Great Depression), the low was reached, but then it bounced in the bottom range for 10 years before the trend really changed in the spring cycle. Very good post from Jim Sinclair’s website by Pedro. It’s that shadow banking system haunting us again. This may be the reason that the White House has not been too stern with BP, only when forced to by public outcry. And this may be why the Federal judge in Louisiana overturned the Federal ban on drilling. Those smaller oil companies need to make money, not stop production, with no one to borrow operations money from. A bankrupt BP is worse for the financial world than Lehman Brothers was for exactly the same reason. If BP does go bust (regardless of whether it is deserved), and even if it is just badly wounded and the US entity is allowed to fail, the long-term OTC derivatives in the oil, refined products and natural gas markets that get nullified could be catastrophic. These will kick-back into the banking system. BP is the primary player on the long-end of the energy curve. Groovygirl’s thoughts: if this info is correct (and we really don’t know until it starts crumbling because there is no regulation of this shadow banking system), we can expect the US government to secretly or overtly bail out BP, not sue it for damages. There are great long-term health dangers for those people near or in the path of this spill. You will have to inform yourself and protect yourself. The financial impact of a falling BP is just one more reason why the government and BP will not do it for you. Check out the link on my blogroll about the true oil spill update. Lots of good links on that website. The chemicals that BP is using to disperse this oil spill are very dangerous, perhaps more devastating than just the oil alone. Please keep yourself informed and protected. Another good link about the dangers of the oil spill. Scroll down to the comment section, too. Click here. Side musing: great video (15 min.) from actual local Louisiana citizen, Kindra Arnesen. Click here. Another side musing: another oil spill video about “oil rain”. Read the comments for opinions about whether oil rain is possible or not. In groovygirl’s humble opinion, the disbursement chemicals could evaporate and create the rain in this video. Click here. Update: bits and pieces coming out about high, very high, concentrations of methane in the ocean and on the surface. This is highly toxic and very dangerous. It could be the cause of Kindra’s children’s (see video link above) breathing ailments and skin rashes. There are also reports of spots on crops, flowers, and gardens in Louisiana. Groovygirl will keep passing this information on. I am not sure if it is true, since we have a media blackout, but we will soon know one way or another. Protect yourself and your family. There is not really any “new” news, but an interesting media development. As you know, when this gold manipulation story broke earlier this year (although it has been trying to break for some time), there was a complete media black out, including a mysterious loss of sound at key points of the televised CFTC hearing. Some investors may be scared to learn that the gold market is manipulated. There is no reason to get out of physical gold, actually all the more reason to get in. Gold has risen from about $250 to $1260 in the last 10 years. That is a 400% return on investment. Precious metals have been the best investment class this decade. And this is all with a concentrated effort to manipulate the market down by the bullion banks. This market is undervalued. Instability in currencies and sovereign debt guarantee a continued rise in gold and silver. A continued rise in gold guarantees more media light thrown on the bullion banks and their tricks of the trade. Now Motley Fool is interviewing Bill Murphy of GATA. It was a favorable interview. Click here. Hopefully, this will educate a little more of the public on this newest Ponzi scheme. Hold only physical gold in a vault not owned by a bullion bank. Side musing: gold is still within “teacup-handle” formation. Click here for Jesse’s thoughts and chart. Side-side musing: silver is really the better value right now. Rumblings of the shorts getting squeezed as investors want physical silver. Click here. So says Jim Sinclair in this exclusive interview with Greg Hunter at usawatchdog.com. Jim is predicting that the euro will stabilize in the fall and the shorts will then attack the USDollar. Whether this is the last of the USdollar remains to be seen. Groovygirl suspects that this is just more waves of money searching for the next safe investment, more volatility, more shorts. Jim is also predicting $1650 gold by 1-14-11. I definitely think we can see $1400 before too long. Martin Armstrong calls for $5000 gold by June 2011. I have heard he has a new update on gold coming out soon, perhaps we will see if he is still calling for that high in 12 months. In my mind anything is possible, this is a sovereign debt crisis in an electronic age. Money changes hands in milliseconds. Regardless, the dollar is still in a downward trend, losing purchasing power for anyone holding dollars long-term. And gold is continuing its uptrend, holding the purchasing power for anyone holding gold long-term. Side musing: I don’t know if anyone saw this as it is not in main stream news. 11 US warships in Red Sea now. Click here. Looks like this situation could be what Jim Sinclair suggested a few months ago: Israel makes a miscalculation and Turkey is a victim. For immediate release, Martin Armstrong’s latest letter dated June 14, 2010 entitled, Can the Euro Survive a Sovereign Debt Crisis? (11 pages) Click here. In the intro, Martin again stresses that we are facing a sovereign debt crisis in all nations. He suggests that there is a big turning point in the DOW in August (key week August 2), but not necessarily new lows because this is a sovereign debt crisis, and investors are searching for security. Check page 3 for the details. (May I remind everyone, his mid-April date for the DOW this year was right on?) These are not new lows or new highs, just turning points. Martin is starting a free service (which has not yet started) for an up-to-date market analysis. Please go to www.armstrongeconomics.com to register your email for free. “This is all about educating what is the new reality.” Groovygirl agrees and looks forward to this updates, as things seem to change on a daily basis. Martin says that while the Euro has high volatility, it has not produced a sell signal. There is primary support for 2010 at 116. (Check out page 11 for the detail.) The rest of the paper outlines the true definitions of money and wealth and how that helps us define what is going on with the euro. Side musing: Jesse from Cafe Americain has a very good post about the violence in Arizona. Click here. Update: gold hit another record high overnight of $1263. The price, sadly, retraced to end the day at $1232, options are expiring this week. It is to be expected with so many bullion banks shorting the market. Another buying dip for those wisely investing long-term.